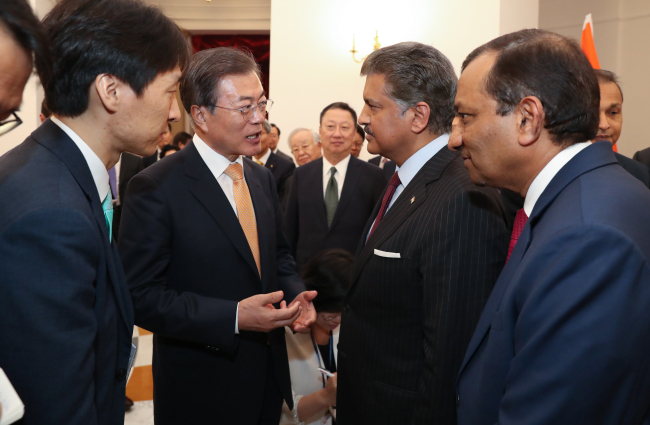 South Korean President Moon Jae-in asked the head of an Indian conglomerate to reinstate former workers at SsangYong Motor who were sacked during the restructuring of the then ailing carmaker. “The issue of reinstating dismissed workers at SsangYong Motor remains unresolved despite a compromise reached between labor and the management,” said Moon when he encountered Anand Mahindra, chairman of Mahindra Group, at a meeting with CEOs of companies from both countries. The chairman told the president that the issue would be resolved by SsangYong Motor’s management in Seoul. Mahindra owns the South Korean carmaker with more than 70 percent of shares, which it acquired in 2011. The meeting was held on the sidelines of Moon’s state visit to India on Tuesday afternoon. Moon was accompanied by Indian Prime Minister Narendra Modi. Former SsangYong workers have been staging sit-in protests for years, after they lost their jobs in 2009. In 2015, the two sides reached an agreement on four agenda items, including the reinstatement of 45. One hundred twenty workers remain dismissed.